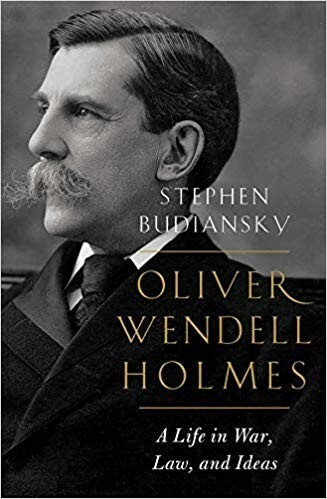 The following is a series of questions posed by Ronald Collins to Stephen Budiansky concerning Budiansky’s book “Oliver Wendell Holmes: A Life in War, Law, and Ideas” (W.W. Norton, 2019, 592 pp., cloth: $29.95). Stephen Budiansky is the author of 17 books of biography, history and science. He was a recipient of a Guggenheim Fellowship in the Creative Arts in 2011. Welcome, Stephen, and thank you for taking the time to participate in this question-and-answer exchange for our readers. And congratulations on the publication of your latest book. Part of the greatness of a great life, I think, consists in leaving it unadvertised. Question: Yours is the latest in a long line of Holmes biographies, including those by Francis Biddle (1942, pp. 214), Catherine Drinker Bowen (1944, pp. 475), Mark DeWolfe Howe (1957 & 1963, 2 vols, pp. 663), John S. Monagan (1988, pp. 170), Sheldon Novick (1989, pp. 522), Liva Baker (1991, pp. 783), G. Edward White (1995, pp. 648), and Susan-Mary Grant (2015, pp. 224). Then there are quasi-biographies such as those by Thomas Healy (2013, pp. 336) and Brad Snyder (2017, pp. 824). Since 1942, there have been 5,683 biographical pages printed in books. That, of course, does not include yet more printed pages in scholarly journals or a vast array of commentaries in books and journals or collections edited by the likes of Felix Frankfurter. What does your biography add to the mix? Budiansky: Thank you, Ron, and glad to have the opportunity to answer your questions about my new biography of Oliver Wendell Holmes. My aim was not to treat Holmes either as the celebrity figure of his first biographers or as a dry specimen for scholarly analysis, but to draw a more fully realized portrait of an exceptional life. Holmes’ experiences over his 93 years spanned a period of tremendous challenge and change in American history, from the Civil War to the New Deal. The challenge to a biographer is to bring together his public and private lives, which in Holmes’ case are both of unusual complexity and richness. There are also three specific areas where I think I was able to shed some important new light on his life and thought. First, thanks to Harvard’s monumental project to digitize his entire archive, I was able to systematically read thousands of important, never-published letters. In particular, his lively and indefatigable correspondence with a dozen or so mostly much younger women friends over the course of many decades is a trove of insight into his ideas and daily life, including occasional misgivings and hesitations that I believe he reveals nowhere else. He writes about his fellow justices, his cases, Washington society; he shares his philosophical musings and frequently humorous observations of the passing scene. In both their text and subtexts, I found these letters to be essential to understanding his character, personality, thought and experiences. Second, thanks to the tremendous generosity of someone who contacted me out of the blue at the start of my project — Judge Hiller B. Zobel, who served on the Massachusetts Superior Court and who had assembled a remarkable collection of Holmes materials over decades of research into the justice’s judicial career — I was able to be the first biographer of Holmes to make a thorough examination of Holmes’ experiences as a trial judge. At the time Holmes joined the Massachusetts Supreme Judicial Court, the justices not only heard appeals but sat individually over many trials — they heard all divorce, murder and equity cases as well as a good many probate and civil actions. Judge Zobel freely shared with me original records he had found of hundreds of Holmes’ trials, and these offer an amazing look at a chapter in Holmes’ judicial career that I think not only has been largely overlooked, but turns out to have been a crucial factor in shaping his judicial philosophy. Finally, I located in the National Library of Ireland a number of letters previously unknown to Holmes scholars that provide a new perspective on his relationship with an Anglo-Irish noblewoman, Lady Castletown, with whom he is often said to have had “an affair” — though frankly I doubt that. Question: Official biographies can take a long time. For example, Chief Justice Warren Burger died nearly a quarter-century ago and his official biography has yet to be published. Something of the same holds true with Holmes, whose official biography was never fully completed. Can you say a few words about that? Budiansky: It was Exhibit A of how trying to restrict access to letters and papers in archives hinders biographers and, perhaps more interestingly, is ultimately self-defeating in its attempt to “protect” the reputation of the subject. Felix Frankfurter was zealous in guarding Holmes’ reputation after Holmes’ death in 1935 and decided that only the official biographer he anointed in 1939 to carry out the task, Mark Howe of the Harvard Law School, would have access to Holmes’ papers. Howe was a prodigious scholar and by all accounts a wonderful person, but his heart was just never in it. He meticulously edited and published Holmes’ Civil War diary and his correspondence with Harold Laski and Frederick Pollock, but could never quite get around to starting on the biography itself. In the end he had finished only two slim volumes before dying in 1967 — and those cover only the first 40 years of the justice’s life, not even reaching his years on the Massachusetts bench, never mind the Supreme Court. After further abortive attempts to have the authorized biography completed, Harvard finally gave up and opened the Holmes papers to researchers in 1985. So the only thing all this secrecy and exclusivity accomplished was to delay for half a century the first serious, complete biographies of the justice. Hardly a boon to his reputation. Question: There are some great Holmes lines that, it turns out, were not actually his words. Can you give us a few examples? Budiansky: Probably the most famous is his oft-quoted assessment of FDR: “A second-class mind, but a first-class temperament,” which he almost certainly never said. He did say something vaguely like that about Theodore Roosevelt, which may have been where the story got started. But every book about FDR seems to repeat it. Question: You write: “[I]t was the Civil War that was his touchstone.” Given that, you dwell on Holmes’ Civil War experience at some length, and impressively so. In what sense was Holmes’ experience the touchstone of his philosophy and jurisprudence? Budiansky: He hated war, and hated reading about the Civil War, but he always acknowledged it as the great transformative experience of his life. At the Battle of Ball’s Bluff he was struck in the chest, and a year later at Antietam was shot right through the neck. Each time the bullet missed killing him by a fraction of an inch. The experience gave him a determination ever after to face life and the unknown with great moral courage, and the conviction that the only thing you could really do about the human condition, as well as its only true source of happiness, was to throw yourself into your work and just “do your damnedest,” as he liked to say, without worrying about success, failure or saving the world. He said to his fellow Civil War veterans in one speech that those who “somehow have survived” that terrible ordeal “know the passion and irony of life.” A profound and poetic thought. The war confirmed his deep belief that life is a gamble and there are no certainties; and by the same token it taught him to be extremely wary of ideological certainty. It really confirmed his philosophical skepticism, which in turn was the bedrock of his judicial philosophy. He often warned that law is not some moral abstraction or lofty ideal, but at root a statement of where society will kill you rather than have its proscriptions disobeyed. A brutal realism, but one that underscored the absolute need for tolerance and compromise over ideological zealotry. Before we try to inflict our moral certainties on the world, he was saying, we ought to pause and reflect first that we may well be wrong — and second that certainty all too often leads to violence. The Civil War also gave Holmes an abiding respect for the so-called common man. He told his friend Harold Laski that the army taught him some great lessons: to be prepared for catastrophe; to endure being bored; and to know that however fine a fellow he thought he was, there were other men whom he might have looked down on had not experience taught him to look up. The lesson that practical ability mattered more than high-minded thoughts or “noble” character was one he never forgot. Question: “To Holmes,” you note, “the act of writing was above all the act of thinking. Finding the right words was not rhetorical ornamentation: it was the very essence of his work of thinking through a complex legal problem.” Fair enough, and he certainly shaped the law in many ways with his wise words. Then again, many of his memorable phrases do just the opposite: they trade critical thought for the magic that comes from his mantras. On that score, permit me to let the late Max Lerner pose the larger question: “are we in danger of accepting him too uncritically?” Your response? Budiansky: I certainly agree we should not accept him, or anyone else for that matter, uncritically. But I don’t accept your contention that his memorable phrases were a substitute for critical thought. Their magic is not some slick rhetorical trick, but rather his ability to crystallize in one striking metaphor or turn of phrase a highly complex argument, a beautiful compression of form akin to what only the greatest poets achieve. Question: On the matter of constitutional interpretation, you note that Holmes kept the same skeptical “eye on the Constitution that he trained on everything.” By that do you mean that the text of the Constitution was neither seriously important nor determinative for him? What do you mean when you say that, if so, “it is more our loss than his failure”? He also observed that the worst offenders when it came to reading their own political views into the Constitution were the very judges who claimed to be strictly following its words and nothing else. Anyone who derived a conclusion of “delusive exactness” from the very general language of the Constitution, Holmes pointed out, was perforce bringing in other values and considerations, acknowledged or not. He reported to his friend the Irish historian Alice Stopford Green the wisecrack he had made to his fellow justices underscoring the point: “I took occasion at luncheon to define constitutional law to my brethren as the prejudices of nine old pedagogues read into an instrument that did not contain them, which I hope gave pain.” I think that’s a healthy skepticism we ought to remember, especially in our day when left and right routinely seek to deploy sweeping assertions of constitutional principle or invocations of absolute rights as the unappealable argument on divisive issues. Question: Professor Thomas Grey tagged Holmes as “the great oracle of American Legal thought.” Judge Richard Posner branded him “the most illustrious figure in the history of American Law.” Professor Albert Alschuler was not so effusive. In his book “Law Without Values” (2002) he wrote: “Despite these hosannas to Holmes, a common theme in writing about him is that he was two people—Jekyll-Holmes and Hyde-Holmes.” What do you think he meant by that? Budiansky: You’d have to ask him! Alschuler employs a lot of tendentious argument and selective quotation to paint a dark caricature of a psychologically damaged Holmes. I believe he fundamentally misrepresents Holmes’ views about war and the life struggle. Holmes had his human failings as we all do, but he was a man of great integrity, moral courage and personal generosity. He also had an abiding sense of humor about the world, life and himself — something Alschuler seems to have no comprehension of. Humorless academics are not a rare species. In brief, what was Holmes’ response to his critics? And how did that make him an “ideal” judge? Budiansky: For the most part he did not respond, though he did write a magnificently dismissive short article about “natural law” in 1918, pointing out the philosophically elementary fact that we are all dogmatic about what is familiar and agreeable to us, yet that does not make our preferences universal, eternal or “natural” truths. I think Biddle’s point was that a judge who can put aside his own even deeply held assumptions embraces one of the most important qualities in a judge — of being able to see both sides of a case without prejudice. How did that affect Holmes’ reputation in the ideological camps of the day? Budiansky: He only expressed those views in private, though he also made a point of saying that if “my fellow citizens want to go to Hell, I will help them. It’s my job.” In other words, he would uphold a statute even if it was imbecilic. He did in fact uphold a more clear-cut action under the Sherman Act the following year in Swift v. United States (1905), the Beef Trust case, writing a strong opinion for the unanimous Supreme Court against collusive price-fixing by the meatpackers. But as he complained to his friend Clara Stevens afterward, “I suppose the capitalists think me dangerous and the labor people think me an eccentric slave of capital. Nobody wants a dispassionate man.” He hated being placed by the newspapers and public opinion in one ideological camp or the other based on his decision in a particular case. Question: Holmes’ subsequent dissents in labor cases such as Lochner v. New York (1905) and Adair v. United States (1908) made him appear to be the darling of liberals. So how liberal was Holmes? Budiansky: He personally was very skeptical about social and economic reforms, and as much as he enjoyed the intellectual company of young liberals like Herbert Croly and Frankfurter, he was never much persuaded by their enthusiasm for liberal causes. That said, his war experience had left him dubious about “causes” of all kinds. Yet both from the war and from his time on the Massachusetts bench he also had a genuine empathy for working men and their problems. He believed that since most things in life are an experiment, people in a democracy have the right to try new things even if he himself was doubtful how much good it would do. Question: What role, if any, did Justice Louis Brandeis (the grand progressive) play in tilting Holmes to the liberal left on constitutional issues? Budiansky: I’m not sure he did as much as many people think. Chief Justice William Howard Taft grumbled that Brandeis had Holmes under his thumb, which gave him two votes, but that was obviously an exaggeration. It’s true Brandeis at times successfully urged Holmes to file written dissents in cases where he might otherwise have acquiesced in silence to the majority. But Holmes was Holmes, and I don’t think Brandeis really reshaped his fundamental views. There were other more important factors in the 1920s that moved Holmes to the “left” on free speech and upholding the rights of African-Americans convicted in mob-dominated trials, in particular. Question: You seem to absolve Holmes somewhat regarding his controversial opinion in Buck v. Bell (1927), the sterilization case of Carrie Buck. You point to how Buck’s lawyer helped shape the result in the case and how Chief Justice Taft influenced Holmes’ opinion. Please share with us your take on the case. Budiansky: I certainly am not out to absolve him for what remains his most notorious opinion, with its brutal punchline, “Three generations of imbeciles are enough.” But I do think the story is more complex than it is usually made out to be. Unknown to the Supreme Court, the case was exactly the sort of collusive lawsuit that — given several other cases that really provoked Holmes’ judicial ire — I believe he would never have gone along with had he known what was going on. Buck’s lawyer in fact was a close associate of the superintendent of the state mental institution who had championed the Virginia sterilization law, and the appeal had been arranged deliberately to create a favorable test case to have the statute upheld. Much of the factual evidence in Buck’s favor was never in the record, and the constitutional arguments presented by her lawyer were notably weak ones. Taft in his memo assigning the case to Holmes particularly urged him to stress the supposed “imbecility” of three generations in Carrie Buck’s family, which the state argued was decisive proof that any additional children she had would end up as public charges. It’s also often overlooked that it was an 8-1 decision, and that eugenics before World War II had considerable public support in America. Only after the horrors of the Nazi regime did opinion really change. Question: In your chapter on free speech circa 1918–1919, you write about the impact that the lives of Harold Laski and Felix Frankfurter had on the redevelopment of Holmes’ free speech jurisprudence. Tell us a little bit about that and why you think their experiences were of such great moment to Holmes. Budiansky: It’s along and fascinating story, but the vicious and anti-Semitic character attacks that Frankfurter and Laski endured at Harvard, coupled with intense pressure from the conservative Boston establishment to have them fired from the faculty for daring to defend free speech for socialists and the rights of striking workers, brought home the price of intolerance in a very personal way to Holmes. Question: Many years before Justice Ruth Bader Ginsburg made it into the movies, there was a full-length Hollywood movie about Holmes — “The Magnificent Yankee” (1950), which followed a 1946 play, which in turn followed “Yankee from Olympus” (1944) by Catherine Drinker Bowen. A Kirkus review of Bowen’s book said this: “The Holmes cult is a substantial one.” How would you value Holmes’ reputational stock at the present point in time? Budiansky: Right now I think he is far less known to the general public than in the heyday of what was undeniably a “Holmes cult” for many decades after his death — today he is to most people little more than a name. I have vague hopes my book will change that. I’m not sure who we could get to play Holmes in the new movie — given his long life, it would take a number of them! Question: Do you suppose that Holmes, if he were alive today, would have any allies on the Roberts Court? If so, who might they be and why? If not, why not? Budiansky: You know, even in his time he not infrequently found that his great brevity and vivid way with words lost him the support of justices who initially intended to join his opinion. Were he on the Roberts Court, he would never be able to stomach those 83-page decisions that seem to be de rigueur these days, so I suspect he’d still be the Great Dissenter, issuing a lot of opinions by himself in his inimitable and ever-so-concise voice.